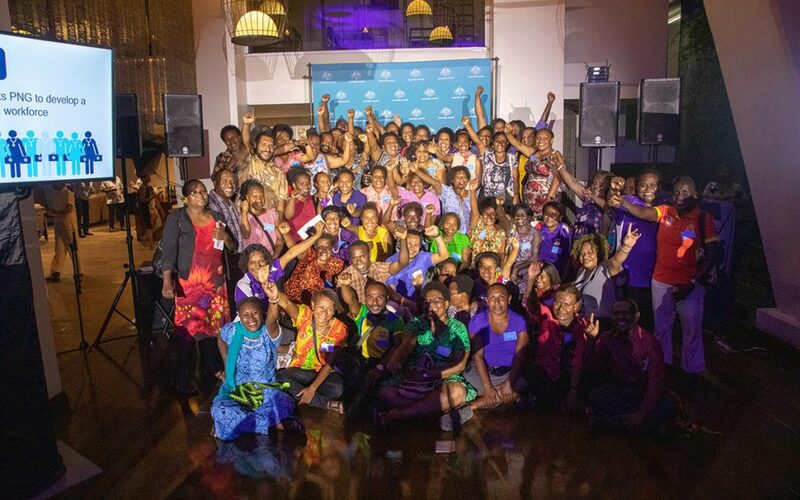 In recognition of the critical role midwives play in improving neonatal and maternal healthcare in Papua New Guinea (PNG), Australia Awards PNG celebrated the achievements and commitment of more than 500 midwife graduates at an alumni event on Thursday 21 March at Airways Hotel. Leading up to the event, over 60 Australia Awards midwifery recent graduates participated in a two-day clinical leadership workshop. The workshop focused on enhancing leadership skills in a clinical setting. PNG has one of the highest maternal mortality ratios in the Asia Pacific region with an estimated 733 maternal deaths per 100,000 live births. The Australian Government in partnership with the Government of Papua New Guinea has been supporting the development of PNG’s midwifery human resources through scholarships for midwives and supporting capacity building for health training institutions that provide midwifery training. Australia Awards In-PNG Scholarships aim to address the targeted vocational skills gap that are required for PNG’s frontline service delivery. They are offered by the Australian Government in partnership with the Government of Papua New Guinea, in addition to scholarships for long– and short-term study in Australia. Offered in collaboration with local education institutions and other stakeholders, the In-PNG Scholarships present a unique opportunity to support the sustainable capacity development of the schools, colleges and universities that host these awardees and the involved professional associations. Since 2012, Australia Awards has offered nearly 600 scholarships for nurses to study the Bachelor of Midwifery at five tertiary education institutions in PNG. The awardees have achieved an annual average completion rate of 97%, demonstrating their strong commitment to their profession. They are now playing critical roles in delivering healthcare services and are contributing to improving maternal and newborn health and survival in the country, including the rural areas. It is estimated that 64% of them are working in the public sector, 25% for faith-based organisations, 9% for non-government organisations and 2% in the private sector. A recent case-study of the Australia Awards investment in midwifery scholarships in PNG showed their positive impact on midwifery numbers, education and services, with these graduates actively applying their skills and knowledge across PNG, often in critical situations.